The workshop centred on the place of the European Union (EU) in the world and global trade; examining how to model convergence, exploring the subjects and objects of convergence as to the EU and the world; ‘court-centric’ and less ‘court-centric’ approaches; and the EU’s bilateral, multilateral and inter-organisational practice as convergence. The City Law School's Professor Elaine Fahey is co-Principal Investigator in the multidisciplinary Horizon 2020 funded MSC ITN EU and Transatlantic Trade and Investment Project (‘EUTIP’) 2017-2021. Professor Fahey, EUTIP supervisor and Work Package 1 leader on ‘Law and Global Governance’, organised a workshop at City on 2nd November 2018. Four Early Stage Researchers (ESRs) in the project, Aakriti Bhardwaj, Isabella Mancini, Alice Manzini and Francesco Pennesi and their supervisors, Professor Jeff Kenner, Professor Elaine Fahey and Professor Fabian Amtenbrink participated, with 24 participants in total from the US and Europe, including academics, policy-makers, think-tanks and EU institution and EU agency legal advisors. 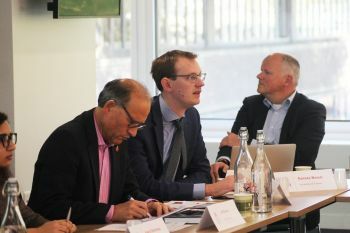 The aim of the workshop was to focus upon the place of the European Union (EU) in the world and global trade; to examine how to model convergence, exploring the subjects and objects of convergence as to the EU and the world; the ‘court-centric’ and less ‘court-centric’ approaches; and the EU’s bilateral, multilateral and inter-organisational practice as convergence. After opening the workshop, Professor Fahey chaired the session, Framing Methodology and Convergence, in which three EUTIP ESRs reflected on the methodological issues with reference to their own case studies and debated about framing the directions of case studies as to EU law and global governance and the appropriate place of inter alia international law, international relations and political economy therein. Alice Manzini presented the paper Towards a Global Reach of EU public procurement law through EU FTAs? Unpacking the components and delineating boundaries, problematising the methodology underpinning the Global Reach of EU law and public procurement through EU Free Trade Agreements (FTAs) and the methodological challenges related to the internal and external dimension of EU public procurement, the measurement of the externalisation of procurement rules and the selection of case-studies, reflecting on the role of international relations and political economy methodology in legal analysis. In his intervention, Is the EU a rule maker or a rule taker in the field of finance? The extraterritorial effect of EU financial law, Francesco Pennesi presented his view on how to assess regulatory convergence and divergence in the area of financial services, reflecting on the main methodological and theoretical difficulties. In her presentation, Isabella Mancini discussed the methodological challenges of analysing and drawing a normative picture of the concept of ‘deepness’ in relation to fundamental rights in the new generation of EU trade agreements with other developed economies. She questioned how a law-in-context approach could support her understanding of deepness and the role of the EU as a convergence actor in its trade relations with third countries. 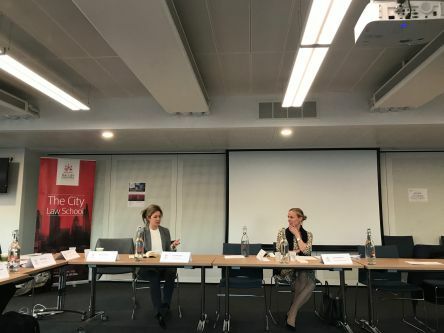 Following the presentations, the City Law School's Dr Adrienne Yong discussed each ESRs' contribution, opening the debate with fellow participants in the workshop. In the third session on Convergence: Deeper, wider or lower (I)?, chaired and discussed by Professor Diamond Ashiagbor, Kent Law School, EUTIP lead supervisor and researcher Professor Fabian Amtenbrink, and Marijn van der Sluis, Erasmus Law School, Rotterdam, presented their paper The race to the bottom? EU Global Convergence. 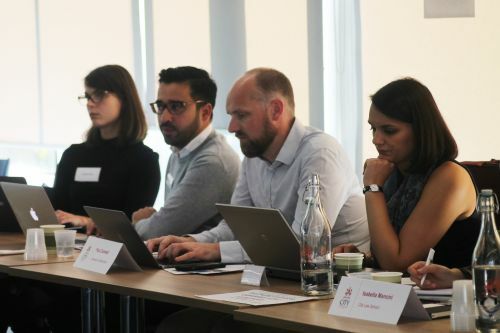 EUTIP lead supervisor and researcher Professor Jeff Kenner and his supervisee, ESR, Aakriti Bhardwaj, University of Nottingham Law School, presented on Global Governance and EU Labour Standards. Their presentation discussed the importance attached to labour rights in recent EU FTAs under the chapter on trade and sustainable development. It questioned whether the differing approaches of the EU and the US on the promotion of labour rights might have implications on the governance of labour standards in Mexico. The workshop concluded with the keynote address of Professor Anu Bradford, Columbia Law School, reflecting on The 'Brussels Effect’ and Global Politics: On Drivers and Trends.